King, Stephen (2000). On Writing (pp. 91-92). Scribner. Kindle Edition. 21 My child, don’t lose sight of common sense and discernment. Hang on to them, 22 for they will refresh your soul. They are like jewels on a necklace. 23 They keep you safe on your way, and your feet will not stumble. Great post. I’ve had many artistic friends over the years that swear by “mind expanding” drugs or drinking. Thanks for the reminder to buy this book too! Glad you liked it. I’m reading this on the Kindle. This post was the last of the bio portion of King’s On Writing. Next chapter starts his brilliant teaching on the writer’s craft. This is like sitting with a master and receiving a one-on-one tutorial. If you’ve had training in composition or even advanced composition you will have read most of this before. What King does so well is make clear statements on what works best in fiction, something different than one gets in most classrooms. He talks about when it is not just OK to break rules but how that to be effective you have to break some rules at times. He doesn’t throw out the style guides but he does express his own opinion. Sometimes he takes exception to the prevailing thought. One of best ‘text books’ I’ve read on any subject. On another point – you had a tweet yesterday on concern about promotion. I assume you were referring to the self-promotion. I feel this is where the writing community can help each other. Most of us are naturally introspective but we care about our readers. I think the same empathy can be used to promote other writers. Hard for me to say in a tweet but that is what I was trying to communicate. Elizabeth Craig posted a similar story on the value of editors. The writer in question felt his book U.K. was a goner in the U.K. A new editor came on and talked up the book with evangelistic enthusiasm. Sales took off. We can help each other. Just PR and Advertising 101. Thank you again and if you will, pass this around. The closest I’ve come to a writing course is English 101 and 102. I have read about 20 books on the craft but from what I have heard other readers say, this one is necessary for fiction, for the same reasons you stated. Just ordered it on Amazon. My degree is in Psychology. I am hoping this will give my writing a unique point of view, but only time will tell. I’m sure you’ve heard the joke where someone asks, “How do you get to Broadway?” When the person says they don’t know, you respond, “Practice!” That is how I feel about writing. My obsession with reading has transferred itself to writing, and so far, it seems to be working well. I understand what you mean about Twitter. It can be hard to express much thought in 140 characters, though it gets easier with time. My big thing with promotion is that I just have not done it yet. I can be a perfectionist, so the literary world is tough enough without thinking about promotion. I am sure I will step up to the plate, though I’m sure my stomach will still be churning. I will be sure to let people know about the blog. I will toss a link up on mine for now, then maybe in a month or two we can swap guest posts. I hear that is a good way to promote! Have you had a chance to check out Book Country or Scribophile yet? I’ve been over on Book Country quite a bit, checking out the other one some time this week. Good places to get some feedback on the writing. Then don’t let my comment on advanced courses throw you. You learn best by reading great authors and having an open mind. King talks about this in the chapter I’m on now. One of Elizabeth Craig’s posts this morning features an article on profiling and archetypes. With your degree in psychology you can latch onto that if you haven’t already.These are keys to character development. You can tell I’m new to Twitter. I an see that it gets easier. Sure have to condense the thoughts. Not bad for any kind of writing. Take your time on promotion but link swapping can help emphasize your profile and name recognition is big. Thank you for your encouragement and support. Just subscribed to Book Country and Scribophile. Have you subscribed to elizabethscraig? She provided good tips and has an online Writer’s Knowledge Base. Great resources. Funny thing about Twitter, for some reason Elizabeth Craig was one of the first people I ever followed, talk about lucky. She is still listed as one of my favorites, only problem I have is trying to read all of the amazing information she shares. You have that right. I think I read her husband does most of the routine posts. Still she is prolific. I’ve just downloaded the Kindle version of her first Memphis Mystery series books. Enjoy her writing style. It draws me into the characters and I can almost smell the aroma’s coming from the bbq restaurant. Glad you are following her. I’m very grateful for this post. I’m still very new to writing creatively or publicly & had started of by blogging. In a week, I will be only 6 months into this journey. While I have a vivid imagination, I am not one of those writers whose bios read something to the effect of ‘I’ve been writing since I knew how to hold a pencil’. in school, I was too preoccupied with achieving & maintaining the grade point average my father expected of me & strictly enforced to take time to write creatively for my own personal enjoyment. Several people have since suggested I try writing fiction–of course, the self-doubt monster that likes to reside in my mind at times wonders why those folks think I could do that–so I have begun to contemplate it. I do have stories to tell. However, like Kirkus, I’ve never taken a creative writing class & most of my educational background has been in medicine–both veterinary & human. I was about to ask, either in a blog or on Twitter, what the best book would be for me to read & learn from if I am to attempt taking the plunge into the world of fiction writing however, the Divine has seen fit to have me stumble across your blog today & answer that question for me. Therefore, after I post this comment of thanks, I am logging into my Amazon account & adding Stephen King’s “On Writing” to my Kindle wishlist in hopes that I am able to afford it soon. Thank you again, for posting this, Rich. 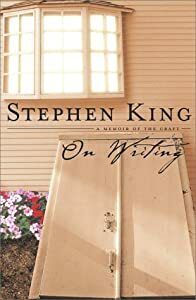 Steven Kings book is a great place to start for advice on creative writing. I don’t think he will disappoint you.